I haven’t been cooking in a really long while. Jia lat! I was tempted to sleep one afternoon but decided to make dinner in the end. Instead of one dish, I attempted two! The first was Rabokki (combination of rameyon and ddokbokki) which turned out pretty good and the other was Gyu Don (Japanese beef rice) that turned out rather meh. It was just like 15 years ago, when the FIFA World Cup was held in Korea and Japan. My two dishes were from two countries that are similar yet different. The anchovy stock formed the base of both dishes. Let’s start with the stock. It was my first time using kelp (seaweed). Previously, I boiled soyabeans and anchovies/ikan bilis. SO MUCH EASIER (and cheaper) than chicken stock!! Haha. Don’t you love that beautiful gold colour? 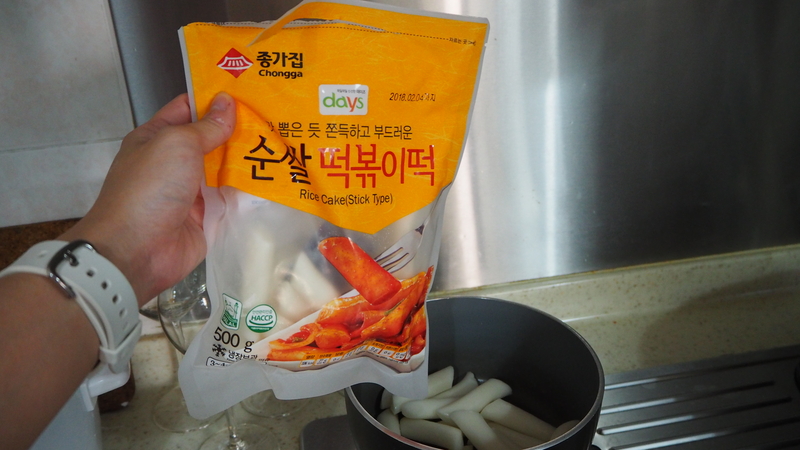 Throw the rice cakes into water to soften them before cooking. I put them in warm water for 10+ minutes. Because processed food tastes good. Also, because JOHNSONVILLE sausages! Having a shallow pan makes it easier to scoop up when sharing. It also makes me feel like I’m selling rice cakes at a Korean street stall like an Ahjumma (Korean for auntie/middle aged lady). Haha. Next up, the gyu don! It tasted great in the pot but when served with rice, it turned out a bit meh. Perhaps the rabokki overwhelmed my tastebuds OR the egg, when beaten, masked the taste of the beef. The colour looks lighter after being coated with (beaten) eggs. Soak the dried kelp in water for an hour or overnight (if you have time) for a richer flavour. Pour stock into a wide pot/steamboat pan thing (if you have), add the sauce and stir it well. Boil it over medium high heat. Once the stock starts to boil, reduce the heat to medium low. Add the rest of the ingredients and as they cook, stir around occasionally. Garnish with chopped green onions and roasted sesame seeds. Chop onions & throw them into oiled pan. Cook till slightly translucent. Throw in beef and cook till slightly pink. Time for salt and pepper to make an appearance. Add water, sugar, mirin and soy sauce. Break two eggs into pot/pan and stir only slightly. I would like to thank My Korean Kitchen for the Rabbokki recipe as well as the Dashi stock recipe and 해먹남녀 for the Gyu Don recipe. I was very anxious to start cooking the gyu don so I broke and stirred the eggs before putting them in the pot with the beef. However, it was too well mixed and the sort of just blended into the dish, creating a somewhat bland taste. Soaking the rice cakes helped to soften them. Now I know why they were so hard (and gross) for the fire Korean chicken dish I made a while back. I’ve really enjoyed the Korean dishes I’ve tried cooking at home so far. So delicious and so much cheaper than eating it at a legit korean restaurant. :p It’s no wonder I keep looking for new recipes to try.